Trademarks, domain scarcity, price negotiations, social availability and so much more. Those were just some of the things involved in choosing a domain name for my new website, Glass Almanac. I’ve already written about how Google and Bing have handled the new site, and promised to write more about what I’m experiencing in launching it in the hopes of helping others who are also thinking about starting a new site/blog. This is the next post in that occasional series. It should reflect the intended news/information angle that I envisioned. It should be as short as possible — preferably no more than two words combined. It should be unclaimed as a name on primary social sites. So I wanted to make sure not to tread too far into trademark areas. I’m not a lawyer, but I do know that there are dozens of news sites that cover Google and have the word “Google” or the word “Android” in their names, and Google doesn’t bat an eyelash over that. With that in mind, I decided I’d probably be okay using “glass” but that using “Google” in my domain, too, might be going too far. Plus, there were already a few other Glass-related sites online with “glass” in their names. I really only used one site to search for domains: Instant Domain Search. What I love is that the site shows you domain availability as you type. I really believe patience is important when looking for domains. Ideas lead to new ideas, which lead to still more new ideas. I spent weeks on domain searching to make sure I had let my mind run through all the different paths it found — variations and more variations, etc. TIP: If you find good domains, register them right away since they’re inexpensive. But don’t settle on the first acceptable domain you find. Keep thinking. Keep searching. You may come up with a new, better idea the following day or week. I ended up with a list of about 20-30 names that were possibilities. I put my list of domains in a spreadsheet and started checking if the names were also available as Facebook Page names, Twitter handles and Google+ Page names. There’s no sense registering a domain for your new website if you can’t get the matching name on important social networks. It’s good to have friends that spend time in the domain space, and I have one in Todd Mintz. I shared my list of options with Todd, and he provided some very wise feedback. The first domain that I fell in love with was already registered, but was available for only $500 from its owner. Sadly, it turns out that someone else bought it from him at about the same time I was making my attempts to get it. I contacted 2-3 other domain owners that had names I liked, but we weren’t able to negotiate a purchase. TIP: Set a maximum price that you’re willing to spend on a pre-owned domain, and stick with it. There are some good salesmen out there that’ll try to convince you to spend more. I ended up sharing a list of about 10-12 domains with Todd, a list that didn’t include GlassAlmanac.com. Todd gave me his advice on the list I sent … but a couple days later I came up with the GlassAlmanac.com idea. We agreed that it was the best name of the bunch. It met all of my requirements: had the word “glass”; reflected a news/information angle; had no more than two words combined; and was also available socially. Winner! I registered it immediately and started making plans for web hosting, finding a blog theme, and so forth. 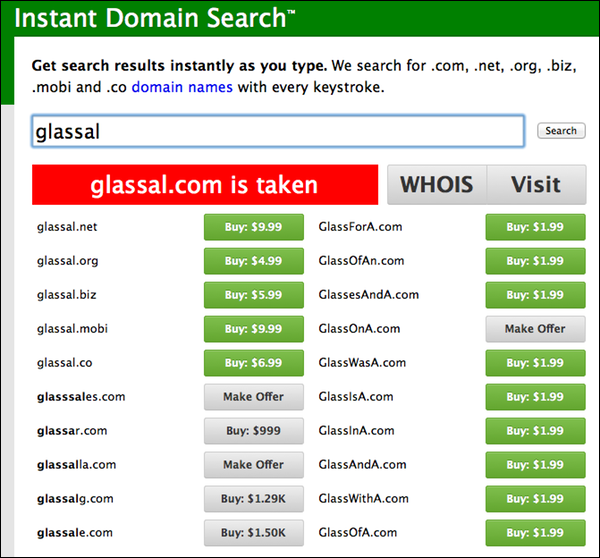 As I was settling on GlassAlmanac.com, the owner of another domain that I liked — it was probably third on my wishlist of pre-owned domains — decided he was willing to sell it. We traded a few emails. I told him this was a hobby website I was starting, not a business with an expectation of making money. My max for buying a domain was $500, and after a week or two of emails back and forth, he finally offered the domain for $500 … but I was already underway with GlassAlmanac.com, and I decided it was a better name than his. So I stuck with my guns. Be patient in researching domains. It may take a while to find The One. My search lasted around 6-8 weeks, and I didn’t even come up with the “almanac” idea until after I had sent a list of finalists for feedback from Todd. Use Instant Domain Search. It’s really great. If you’re thinking about buying a domain that’s already owned, set a max price you’re willing to spend and stick with it. Make sure the names you’re considering are also available as accounts on the major social networks, or anywhere else you expect to setup shop. The site’s been online for about 3.5 months now and I’ve come to love the domain. I’m really glad that I spent 6-8 weeks exhausting all the domain ideas I could find, rather than buying a building something in the first week. PS – Todd, thanks again! Very interesting story. Always wondered why “almanac” – this explains it! It’s important to start out on the right foot. In my case, i had a hard time finding my domain because my name combined with additional keywords like photography caused a problem. I didn’t want to start off with a problem to fight, so I worked that to determine an available domain that was also not already blacklisted. Matt thanks for your thoughts on choosing a domain and social presence. I have a general rule for local small businesses. Keyword in the name, location, and explains the service. And if you can make it brandable even better. But I predict the need for location in the name to matter less and less into the future. My ideal is the domain is the name of the business but if that is taken choosing a keyword domain or tacking on the location at the end of the name such as Rotor Rooter or Rotor Rooter Atlanta.